A fast recap: in the last week, we have 10 new draft selections, a new coach, a new second-line center, and sayonara to two players (with a third possibly on the horizon). Shall we dive into the changes? 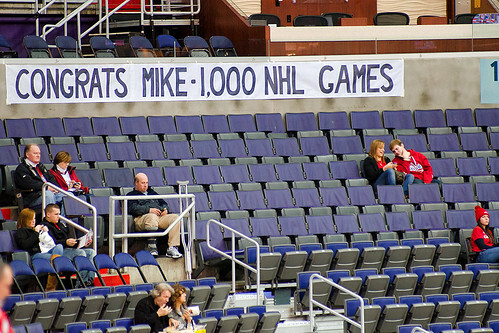 With Dale Hunter’s resignation at the end of the Caps playoff run in mid-May, things certainly didn’t look stellar for the team. Caught in some weird identity crisis, the Caps needed to look hard and long for a quality coach that was going to elevate the team. General manager George McPhee took his time; many thought a coach would be named just before the NHL Draft. Well, come draft day McPhee had a short list of candidates but no coach signed. That happened this past Tuesday, when recently-announced Hockey Hall of Fame inductee Adam Oates was tapped for the bench boss position. Recently off a stint with the New Jersey Devils as an assistant coach, Oates signed a three year contract with the Caps. The new Caps boss faces a tough road ahead. The team’s offense has sputtered under the defensive orientation of Bruce Boudreau’s later term and his replacement last season, Dale Hunter. Captain Alex Ovechkin’s season is an excellent marker for just how tough the Caps’ struggle was: Ovie had a career-low 65 point season. But it’s not going to be as easy as that. Oates, while a stellar offensive player, learned the value of strong defense as an assistant with the Tampa Bay Lightning (2009-10) and the Devils (2010-12). “We’re going to talk about [Ovechkin's] game,” Oates said yesterday, “but I still think the physical aspect of his game is unprecedented. I think he’s a special player and in terms of adding to his game, I think I can. But he’s got to earn my trust as a coach first and it will be a process that we’re starting soon. Oates knows what’s in store. While he definitely has his work cut out for him, it looks as if the Caps have landed a coach who will do what it takes to make the team more well-rounded. And a well-rounded Caps team will not only be successful, but fun to watch. The Caps walked into Pittsburgh’s CONSOL Energy Center last week with 11 picks, more than any other team. At the end of the day on Saturday, the Caps walked out with 10 new draftees. The number of selections equaled their 2010 and 2011 picks, combined. Right behind Forsberg, the Caps nabbed Thomas Wilson with the 16th pick. A big right winter with the Plymouth Whalers in the OHL, Wilson has talent that Caps scouts think will improve and develop. His 27 points and 141 penalty minutes in 49 games last season seem to bear that out, but he may need another year or so in Hershey after his stint in Plymouth is over. Rounding out the rest of the pick pack, the Caps selected forward Chandler Stephenson, center Thomas Di Pauli, right wing Austin Wuthrich, defenseman Connor Carrick, right wing Riley Barber, defensemen Christian Djoos and Jaynen Rissling and goaltender Sergei Kostenko. The biggest news of the draft – aside from Jordan Staal’s trade to Southeast Division rival Carolina Hurricanes – was the Caps’ trade for Dallas Stars centerman Mike Ribeiro. The veteran was acquired in an exchange for prospect Cody Eakin and the 54th pick of the draft. Ribeiro, who had 18 goals and 63 points in 74 games with the Stars last season, is an instant upgrade to the Caps’ lagging offense. Ribeiro’s had eight consecutive seasons with 50 or more points and has notched 50 or more assists three times in his career. The 12-year veteran brings some toughness to the second line and will fill a leadership role recently vacated by the departing Mike Knuble. Many thought the Ribeiro trade would be the last splash the Caps made before Sunday’s UFA rodeo. McPhee blew that apart late yesterday when news broke of Dennis Wideman’s departure to Calgary for defenseman Jordan Henry and a fifth-round draft pick in the 2013 NHL Draft. It was widely assumed that Wideman, who would have hit the UFA market on Sunday, would not be returning to the Caps despite recording 46 points (35 assists) and 97 penalty minutes in 68 games last season. That McPhee leveraged Wideman for a prospect and a late draft pick – effectively getting something for nothing – shows the team’s eagerness to build on their recent string of June successes. With Wideman’s surprising trade, speculation now begins on whether McPhee can do the same with the rights to Alexander Semin, who is also a UFA on Sunday and is not expected to be re-signed. The winger defines “mercurial” and has had seven up-and-down seasons with the Caps. Some believe Semin’s contract demands outweigh his actual game value. Barring an overpriced offer from a desperate team, it’s likely Semin will be playing in Russia with the KHL come winter. Aside from Knuble, Eakin, Wideman, and (most likely) Semin, two others have left the organization. Tomas Vokoun was traded in early June to Pittsburgh, where he’ll serve as a replacement for backup goalie (and former Cap) Brent Johnson. And winger Chris Borque, a Caps prospect that many thought might migrate to the team in the next year or so, found himself traded off to Boston for center prospect Zach Hamill. The Vancouver native played 16 games with the Bruins last season and has registered 139 points (95 assists) in his 256 game AHL career. Overall, the Caps are looking healthy in future depth. Solid selections in the draft, some shrewd trading, and a continually strong Hershey Bears organization will give the Caps some much-needed relief down the stretch. Of interest right now is how the Caps will look come September training camp. The team has 17 players signed for the next season but has some holes to fill, and only $20.9 million under the cap to play with. Can McPhee make some more magic and drop the rest of the pieces into place? Sunday’s free agent fracas will be interesting to watch, no doubt about it.